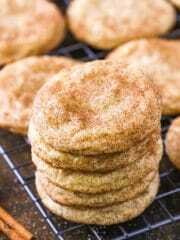 Classic Chewy Snickerdoodle Cookies Recipe | The BEST Snickerdoodles! 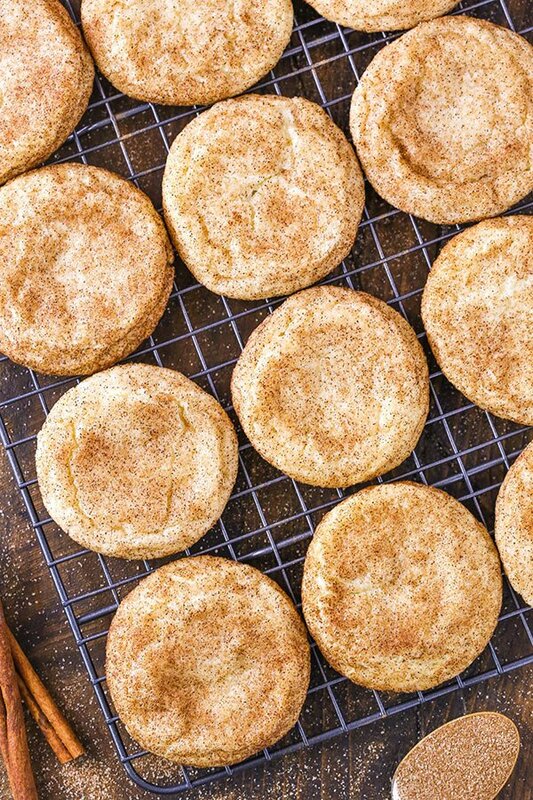 These Chewy Snickerdoodles Cookies are soft and buttery cookies that are covered in cinnamon and sugar! Such a classic cookie recipe and one of my favorites! Cookies are one of the best parts of Christmas. 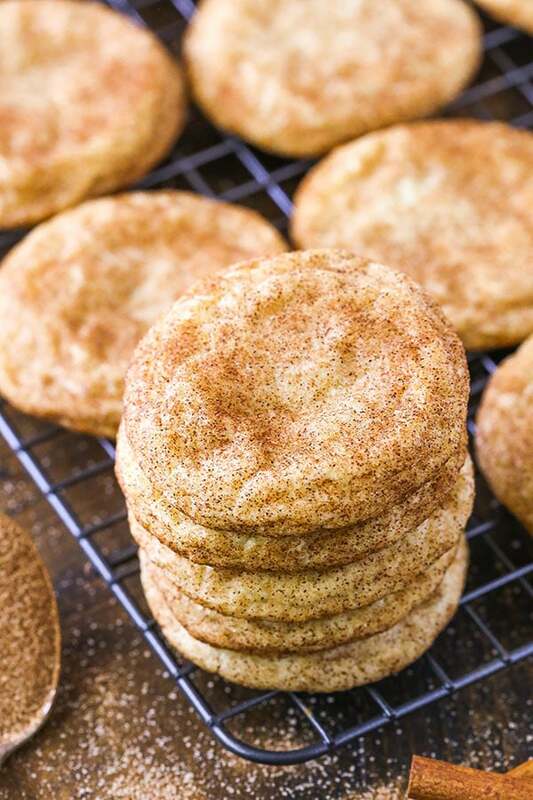 And since cinnamon is one of my very favorite ingredients and flavors, these snickerdoodles are no doubt one of my favorite cookies. They make the prefect Christmas cookie! To get started making the best snickerdoodles, you’ll want to cream the butter and sugar together. It should be light and fluffy when it’s ready. You’ll then add the eggs and vanilla extract, and finally the dry ingredients. The dry ingredients includes one of the most important ingredients in a classic snickerdoodle – the cream of tarter. 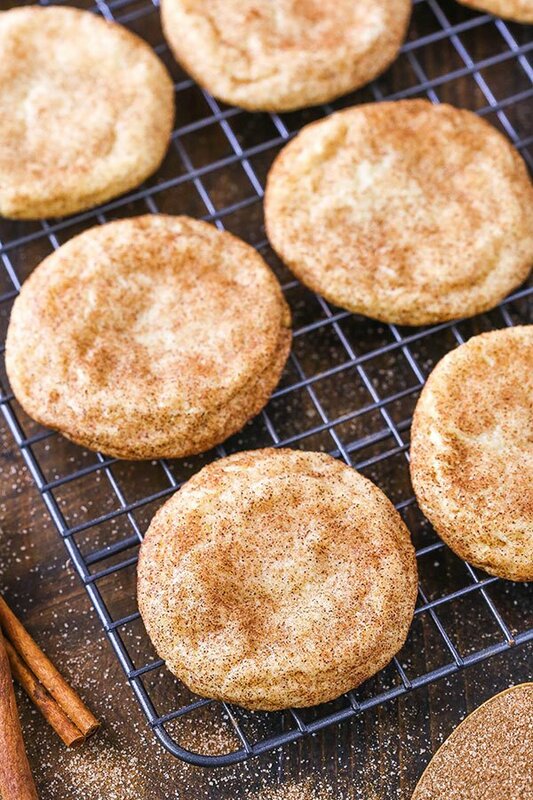 It gives the snickerdoodle that tangy flavor we all know and love, so it’s definitely a must! Once the cookie dough is prepared, it’s time to roll it into balls. I didn’t refrigerate it before hand, but you certainly could. If you wanted to make them ahead even, you could refrigerate the dough for a couple of days before using. After you roll the dough into balls, roll them in the cinnamon and sugar mixture and make sure they are fully coated. When it comes to baking these cookies, it was important to me that they don’t spread too thin, but I also didn’t want to add a bunch of flour and have them be too dry or dense. One way to make sure they don’t spread too much is to bake them at a little higher temperature. These cookies bake at 400 degrees. It helps the edges set more quickly, therefore not spreading too much. The other thing I suggest for these cookies is to use a dark cookie sheet. The dark color absorbs heat more quickly, also helping to set the edges of the cookies more quickly. The final snickerdoodle is soft, chewy and delicious! An addicting cookie that I come back to over and over. You just can’t beat a cookie covered in cinnamon and sugar! 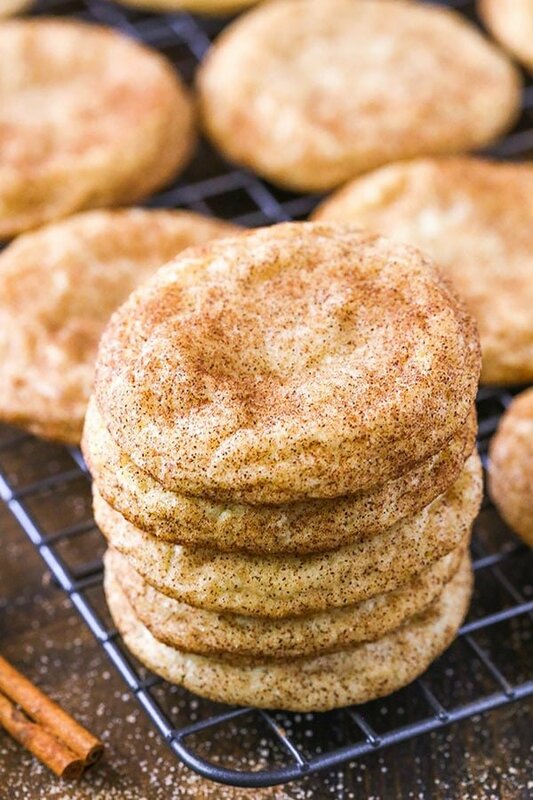 These Chewy Snickerdoodles are soft and buttery cookies that are covered in cinnamon and sugar! Such a classic cookie recipe and one of my favorites! 1. Preheat oven to 400 degrees. Prepare a cookie sheet (I recommend a darker cookie sheet) with a silicone baking mat or parchment paper. 2. Combine the flour, cream of tarter, baking soda and salt in a medium sized bowl. Set aside. 3. Add the butter and 1 1/2 cups of sugar to a large mixer bowl and cream until light in color and fluffy in texture, about 2-3 minutes. 4. Add the eggs one at a time, mixing until combined after each. Scrape down the sides of the bowl, as needed. 6. Add the dry ingredients and mix until combined. 7. Combine the remaining 3 tablespoons of sugar with the cinnamon in another small bowl. 8. Create balls of one tablespoon of cookie dough each. 9. Roll each ball of cookie dough in the cinnamon sugar mixture, then set on the prepared cookie sheet with about 2 inches between them. 10. Bake for 6-8 minutes. 11. Remove cookies from the oven and allow to sit for 2-3 minutes, then move to a cooling rack. 12. Store cookies in an airtight container. Hello Lindsay. 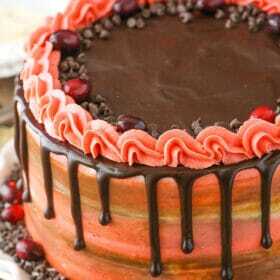 I love your recipes they are the best. Here in Spain we don’t use to do this type of cookies so I am about to do them this weekend. My only doubt is, do you think I can change the butter for olive oil? We don’t use to use much butter here at home, as I can’t eat it, so I always try to substitute the butter for olive. Do you think it will work? Thank you for all your help. Hugs from Barcelona. No, olive oil wouldn’t work in these cookies, I’m sorry. It’s much too soft compared to the butter. Could you sub Coconut Oil ? It would give you a different result, but you could try it. Very delicious! I love snickerdoodles also, but I couldn’t find my recipe. I tried yours and it is excellent. 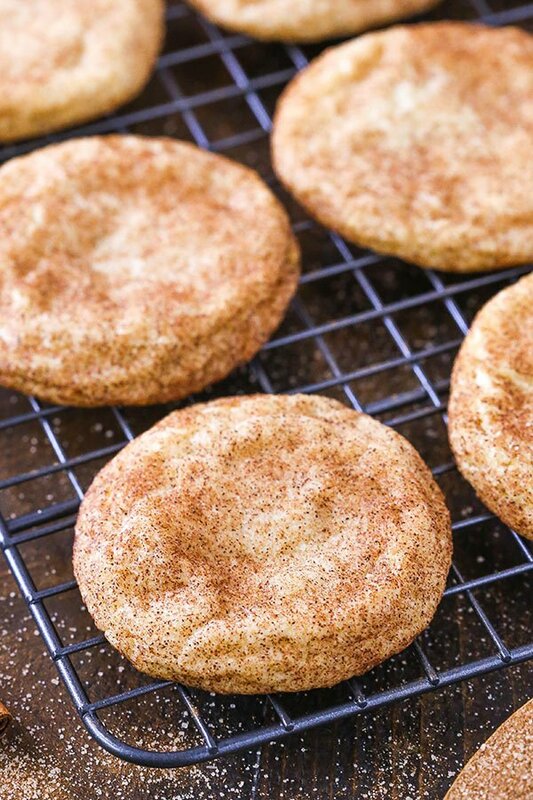 This will be my new go to snickerdoodles recipe!! Thank you! 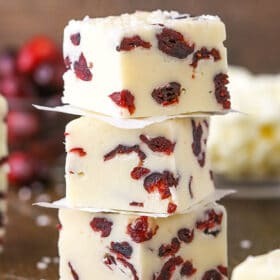 I’ll be making these delicious for sure, juat wondering, is it ok to mix up the batter and bake them off the next day? Thanks for the receipe!! The cookies tasted delicious but they were rather thick, I wish they were spred thin just a lil more. Any suggestions on what I did wrong? They we’re still rather domed rather than flat like a cookie, but still very tasty. Maybe I should make them bigger next time? Hmm, there could be a number of reasons. How did you measure your flour? I measure by weight to be sure that it’s accurate, but if you are using a scoop, you don’t want to pack the flour in. Or did you happen to refrigerate the cookie dough at all? It sounds like your cookies didn’t spread very well, so either something wasn’t measured quite right making a thicker cookie dough, or they were cold when they went in the oven, or something else that would have affected the way they spread when baking. Great recipe Lindsey! I love to cook and entertain. I baked these cookies for holiday entertainment. It was a big hit. I’m so glad you enjoyed the cookies! I liked that this recipe didn’t call for chilling the dough. However my cookies came out very spread out and not fluffy enough. Try refrigerating them before baking. Worked good for me. 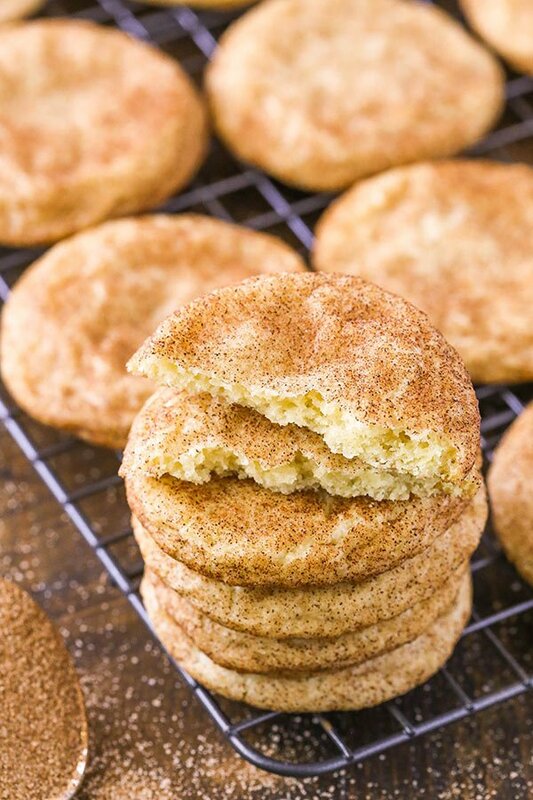 My husband loves snickerdoodles but I have never made them before. I found this recipe on Pintrest and tried it the same day. It was WONDERFUL! My whole family loved them and that is not an easy task!! Thank you so much for posting this!! I’m so happy to hear that! Glad you enjoyed them! And again another perfect recipe! I had another one that had more butter, and I always thought there was something to improve, and yours uses less butter, and the snickerdoodles are so so good! Also, no chilling, that’s so much easier! Thank you so much! I love snicker doodles. This is a 5 star recipe for sure. Soft chewy and full of great snicker doodle flavor. I’m going to try this recipe. My mother had, (almost) the same exact recipe. Except she used shortning instead of butter. When I decided to try her recipe I was apprehensive about using shortning. So that is why I want to bake your recipe. I’m excited and can’t wait to bake my childhood favorite. But, can you tell me the difference between using shortning vs butter? A added fact, my mother’s recipe is about 60 70 years old. Thank you. They are similar in many ways, but in this case differ in flavor and texture. The shortening is firmer, so the cookies will bake a little differently. Great recipe! They came out awesome. I subbed 1/2 tsp of the cinnamon with nutmeg, and added a dash of cloves, plus about 1/2 teaspoon of superfine “popcorn” salt to the rolling mixture. So, so good. The popcorn salt sounds interesting! Fun! I’m glad you enjoyed them! I love snickerdoodle cookies and couldn’t wait to try this recipe. However, I put them in at 400 for 8 mins and they came out raw. I put them in for another 3 mins but they still weren’t right. I’m sorry you had trouble, but that’s a pretty normal baking time for the size of cookie specified. Did you happen to make larger cookies that would have needed more time? These are the best dang snickerdoodles I’ve ever had. I cannot stop eating them, and I’ll probably never use another recipe! You can, but it is kinda an iconic part of a snickerdoodle and it would change up the texture and flavor of the cookie a bit. I made these cookies last night with my 3 year old son. The recipe was easy to follow and delicious! Chewy and soft just like we like them! Delicious! A little Crunchy on the outside and chewy on the inside. When out of the oven, I added a little more cinnamon sugar to the cookies. So good. What size should the dough balls be? I mention in the recipe that you use one tablespoon of cookie dough per ball. I prefer to use that sort of measurement than a ball size. It seems more accurate. Thanks for this recipe! I had a craving and it’s always nice to have an excuse for having purchased cream of tartar! I really enjoyed these cookies! I was hoping for a really spread out cookie, but mine turned out to be scone like. Any suggestions on what might have gone wrong?